August 16, 2018 December 20, 2018 - by huma Iqbal - 2 Comments. 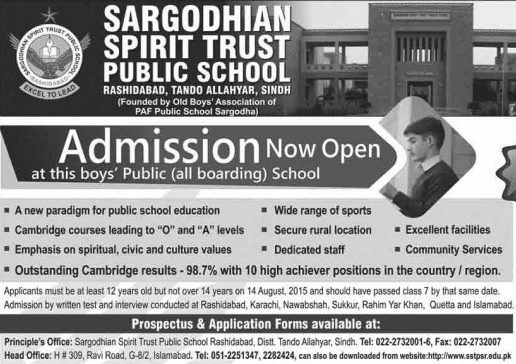 Admissions in Sargodhian Spirit Trust (sst) Public School Rashidabad Tando Allahyar Sindh Open admissions deadline of receipt of admission applications Saturday 21 January 2019.
the applicant must have passed class 7. and age must be between 12 to 14 Years old till date 1 April 2019.
the applicants must have passed Class VI. All applications along with pay order / DD of Rs. 2000/- are to be sent to SST public school Rashidabad, Tando Allahyar Sindh. Pre-Cambridge: The initial year at the school is used to bring students coming from diverse educational backgrounds at par with one another. The major emphasis is on developing communication and writing skills in English and Urdu languages; Islamiyat, Fundamentals of Science, Mathematics, History, Geography and moral tenets. Cambridge-I and II: The 2nd and 3rd years at school prepare students for 8 subjects to enable them to take Cambridge IGCSE examination. A range of optional subjects is offered to allow student to pursue subject of their own interest.